In the space of a few short years, the Port of Hamilton has emerged as southern Ontario’s primary export gateway for Ontario-grown grain, and the nucleus of an expanding food cluster within the region. In 2017, the Port of Hamilton handled its highest-ever total of agricultural products. Close to 2.3 million metric tonnes (MT) of commodities such as Ontario-grown corn, wheat and soybeans, as well as canola, sugar, potash and other fertilizers were handled through the port. Agricultural cargoes now make up 23 per cent of the port’s total, up from 12.5 per cent in 2010. From the perspective of the Hamilton Port Authority (HPA), success has been the result of a convergence of factors: a push toward diversified cargoes; an entrepreneurial approach by the port that enables projects to move forward quickly; and a supportive network of regional partners in government, education and industry. HPA President & CEO Ian Hamilton underscores the importance of the port’s ability to respond to market opportunities: “Global demand for food is growing, and Canada has an impeccable brand internationally for food safety and quality.” Capacity at the port has been growing steadily to keep up with this demand. “The Port of Hamilton has attracted more than $200 million in agri-food related private sector investment in recent years, and our terminal operators have the ability to move more product, more efficiently, helping make Ontario-produced crops more competitive in global markets,” said Ian Hamilton. G3 Canada Ltd. selected Hamilton as the location for a new, $50 milllion, 50,000MT grain export terminal on the Great Lakes, a facility which came into operation for the first time in the 2017 shipping season. 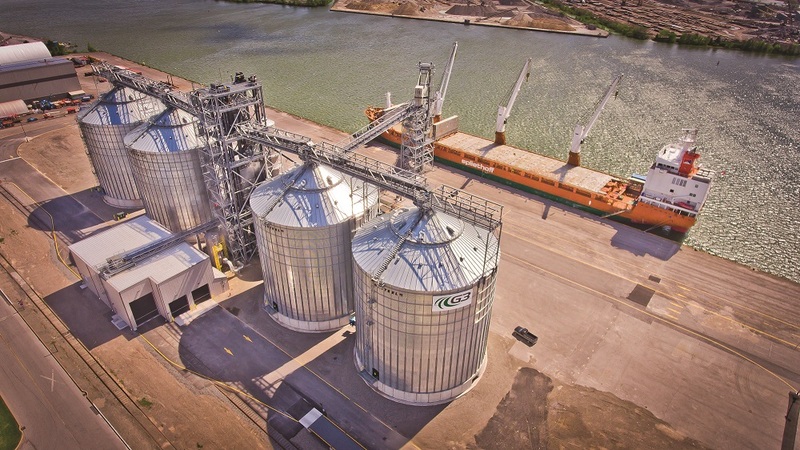 The terminal is the centerpiece of G3’s entrance into the southern Ontario grain handling market. Consistent with G3’s other new facilities across Canada, G3 Hamilton features technology that maximizes facility load and unload speed. “Attracting new investment is the critical first step, but our approach to business means we don’t stop there,” said Ian Hamilton. “Our team of real estate and engineering experts work with investors every step of the way to ensure projects are implemented successfully.” In some cases, that also means coming to the table with innovative financing partnerships, as was the case when fertilizer handler Sylvite was looking to expand its storage capacity. Also in 2017, grain company Parrish & Heimbecker began operations at a new, $45 million flour mill, located adjacent to the company’s current grain export terminal at the port. The facility was the first new-build flour mill constructed in Ontario in 75 years. All of the product from the mill is used within 100km of Hamilton, part of southern Ontario’s flourishing regional food processing industry. One of the region’s most effective catalysts in building a robust agri-food cluster is the City of Hamilton’s Economic Development Office. The City’s team has identified agri-food as a key investment target, and has attracted high-profile food processors such as Canada Bread and Maple Leaf Foods. In fact, Hamilton is one of the three largest food and beverage processing areas in North America. Nearly 9,000 skilled workers are involved in agri-business and the food-processing sector, and food and beverage manufacturing the city’s second largest manufacturing sub-sector, both in terms of employment and revenue. Employment in food manufacturing has grown 35 per cent in the city since 2006, and workers in this industry have seen their wages rise by more than five per cent. Another secret ingredient in the region’s food-sector success is the accessibility of world-class educational institutions with highly specialized programs in food and beverage. These include the Canadian Food and Wine Institute at Niagara College, the University of Guelph’s Food Technology Centre and Conestoga College’s Institute of Food Processing Technology.